Tribune Chronicle / Renee Fox Zac Hanley of Hubbard, Tyler Miller-Gordon of Youngstown and Bradley Linton of Austintown said they were caught up in the energy of having the Cleveland Indians play in the World Series. Making the series stretch through Game 7 upped the emotional buzz and made the young men feel connected to others in the community, they said. 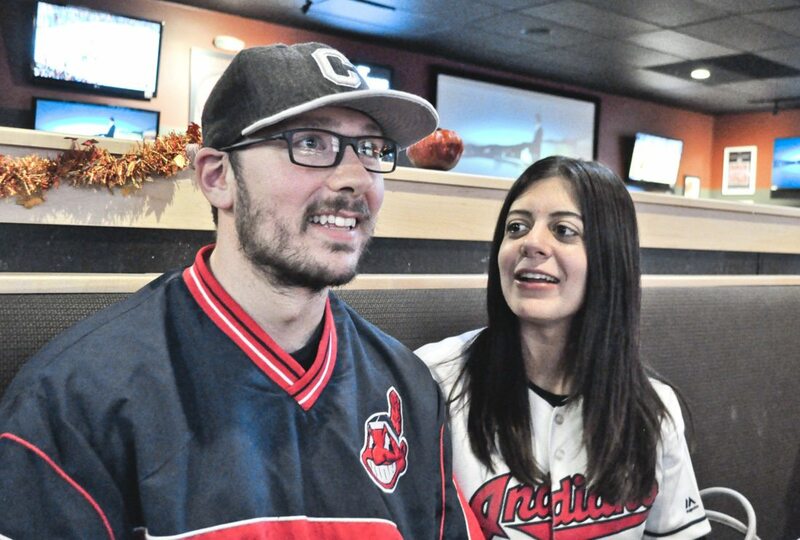 NILES — The thrilled cheers of Indians fans traveled Wednesday from Progressive Field south through the Valley, where they were echoed by local fans holding their breath and heaving with the energy of Game 7. 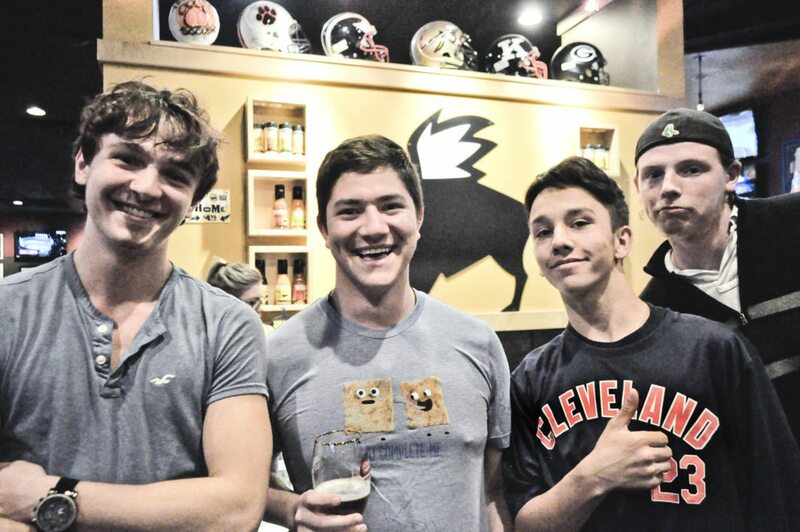 The cheers and groans were heard collectively by a crowd dominated by fans of Cleveland’s Major League Baseball team at Buffalo Wild Wings restaurant and sports bar in Niles. There were Chicago Cubs fans there too, but they were sparse. The Cubs had a leadoff home run to start the game, but Indians fans didn’t have to wait long to log a run of their own in the third inning, tying it up. “Its a tough start, but it’s a long game, we have time to get some runs on the board,” said John Ross of Howland. The room was generally optimistic at first. 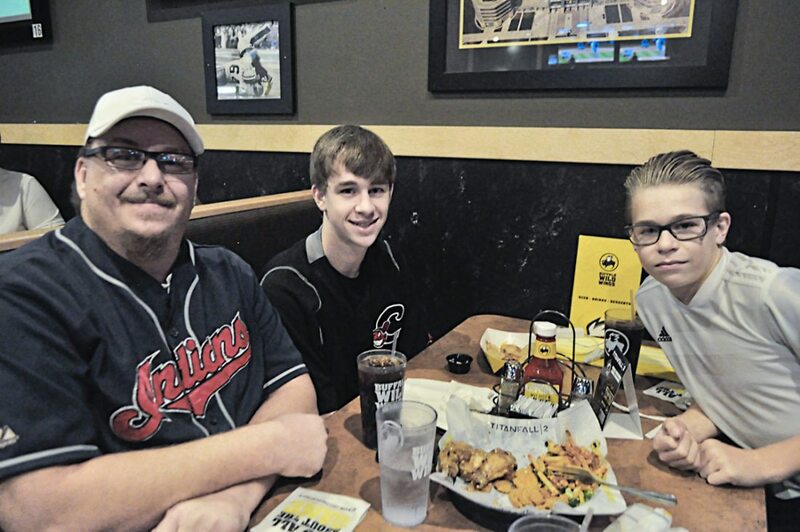 Tribune Chronicle / Renee Fox John Harsany, Jacob Harsany, 17, and Austin Harsany, 13, all of Warren, started Wednesday night with an early optimism at Buffalo Wild Wings in Niles. Jacob Harsany said the Cleveland Indians are an inspiration to him, a player himself, and that maybe he should have worn the lucky socks he wears for his own games. “It was a rough start for Cleveland. They need to get it settled down and continue to master the Cubs like they were doing,” said John Harsany of Warren. Chicago put that on hold, notching up a few more runs before the end of the end of the fourth. Isn’t it odd too, Harsany asked, that the Cleveland Cavaliers were down 3-1 in the 2016 NBA Finals when they turned it around, pushing off the Golden State Warriors in a 4-3 series. And now, the Indians started with a 3-1 advantage in the series, only to see it level out and stretch into Game 7, Harsany said. The Cubs got two more runs in the fifth. Harsany said he hoped to make a victory call to his father, a native of Cleveland, who was 3 when the Indians last won the Series in 1948. Jacob Harsany, 17, a third-generation Tribe fan, said the Indians are a team he looks up to as a baseball player himself. Zac Hanley of Hubbard agreed with Harsany, noticing the similarities and differences between the NBA and MLB finals. He said some of the games in the Series have been disappointing — mainly the games where the Cubs garnered large, insurmountable leads. But, Hanley said, the close games have made it a “decent” Series. Tyler Miller-Gordon of Youngstown said the atmosphere and connection to Cleveland had him excited to be among fans Wednesday.